Few things are more thrilling than hearing your music played by a group of highly skilled musicians. While recording a live orchestra is certainly a fabulous experience, it can also be a bit of a challenge, to say the least! There is so much to consider: hiring a team, microphone types, mic placement, recording techniques… In this course, music composer and producer Olajide Paris shares his wisdom on the topic. Olajide Paris starts by describing the roles of each person in the Scoring team: the engineers, the assistants, orchestrators, copyists, etc. Next, Olajide talks about different microphone types used in orchestral recordings. You learn the difference between large and small diaphragm condensers, tube and ribbon mics, and you get some great insights on using them, including information on mic placement in the context of a cinematic recording session. Last but not least, you see and hear the recording of an orchestra (strings, brass, & winds) and compare it to the original MIDI mockup. 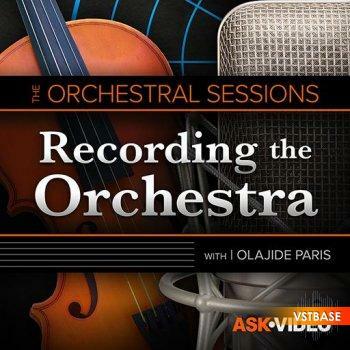 So join music composer and producer Olajide Paris in the final installment of the Orchestral Sessions series, and learn how to best approach orchestral recording sessions.